For those of you with kitchens that don't have corner units, you haven't had the pleasure of trying to crawl in to the dark recesses of you cabinets to try and find that salad spinner or strainer that you know is in there somewhere. Thankfully, those of us that do have the privilege of having access to that space are able to install more options than ever to get to those things that are so well tucked away. Here's a list of the most common accessories of choice. These units have been the standard in the industry for many years. Circular in nature, they spin around for quick access to many items in your cabinetry. Pros: relatively inexpensive, simple to operate; useable in regular and 'blind' corner cabinets. Cons: sometimes 'tippy', does not maximize the space in the cabinet (round unit in a square cabinet), most units don't pull out of the cabinet. Often referred to as a "Magic Corner" these options are almost ubiquitous in current kitchen designs. They are two-fold (pardon the pun) units whereby one portion of the magic corner is pulled out and twisted, and the second part then moves from the dark corner into the front of the cabinet, and sometimes even pulls out from there. Pros: excellent use of available space (square units in a square cabinet), smooth operation, exceptionally easy access to much of the stored items; stable. Cons: quality ones can be expensive, lots of moving parts, and lesser quality units can break down. The hybrid Susan or LeMans corner as they're often braned as are a unique option. They are available for 'blind corner' cabinet only, but they're shaped almost like a peanut. The reason for their odd shape is that they almost wiggle out of the corner cabinet in a defined path, allowing the shelf to sneak around corners to bring its entire breadth out of the cabinet and into full view. Pros: good use of the cabinet space, less expensive than most pull-out mechanisms, stable. Cons: more expensive than lazy susans, it's a two step system whereby you must open the door first and then pull the unit out. Less effective with round storage options. On first blush, a corner drawer would seem to waste far too much space to be practical; however in the right application they can be the most effective of the corner options. By making the most effective use of the depth of a corner cabinet and then combining that with the ease of access a drawer has to offer this might be the ultimate solution, even though some space is lost due to its construction. 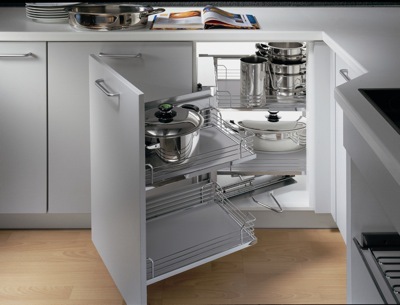 Pros: excellent access to the corner space, intuitive use of drawer slides, extra deep drawers for a multitude of items. Cons: significant lost storage space, on of the priciest choices of corner solution. Which one should you choose? There's no general right or wrong answer here. The best choice is the one that works best for the way you live in your kitchen and the design of the cabinetry. Consult with your Reynolds kitchen design specialist and they'll be able to suggest the most valuable option for you project. Have an opinion or another favourite corner option? Let us know!